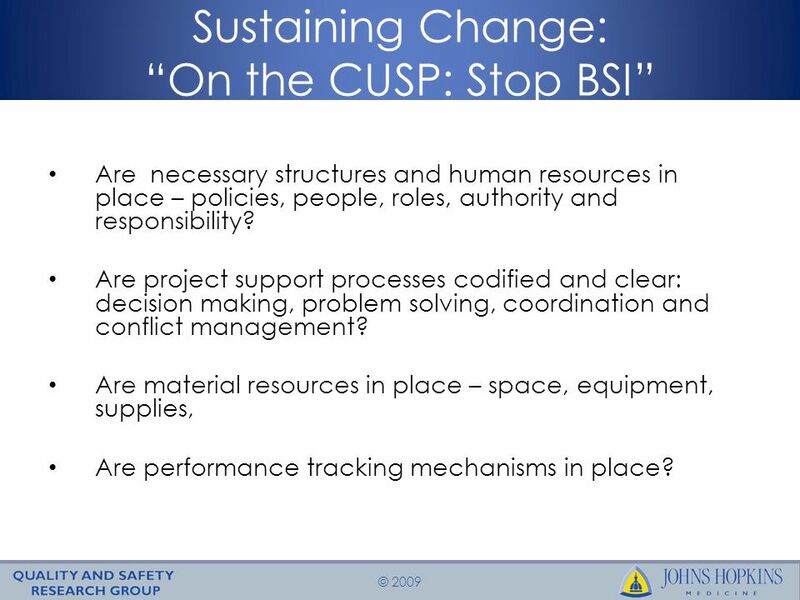 3 © 2009 Sustaining Change: On the CUSP: Stop BSI Are necessary structures and human resources in place – policies, people, roles, authority and responsibility? 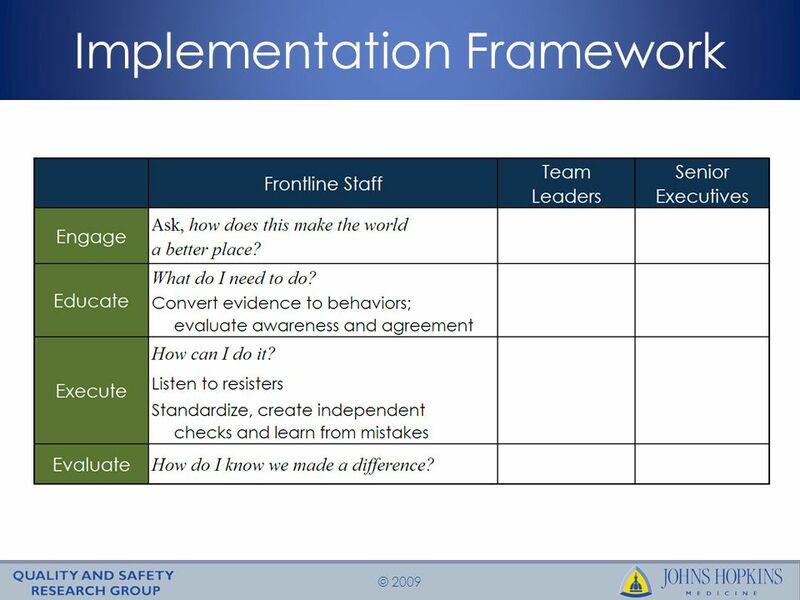 Are project support processes codified and clear: decision making, problem solving, coordination and conflict management? 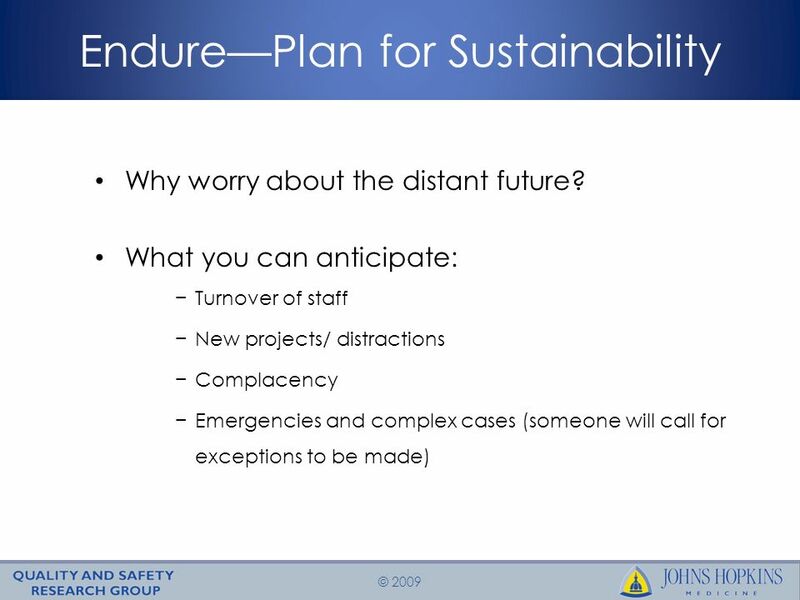 Are material resources in place – space, equipment, supplies, Are performance tracking mechanisms in place? 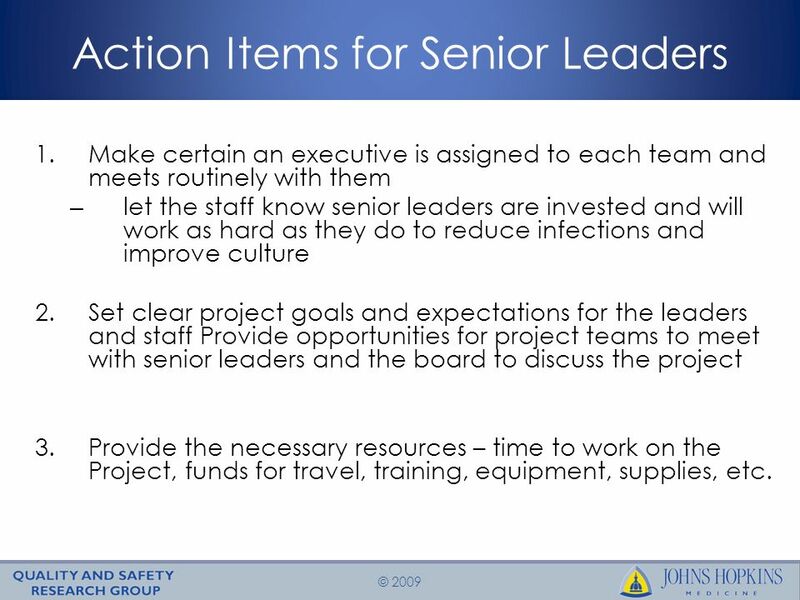 4 © 2009 Action Items for Senior Leaders 1.Make certain an executive is assigned to each team and meets routinely with them – let the staff know senior leaders are invested and will work as hard as they do to reduce infections and improve culture 2.Set clear project goals and expectations for the leaders and staff Provide opportunities for project teams to meet with senior leaders and the board to discuss the project 3.Provide the necessary resources – time to work on the Project, funds for travel, training, equipment, supplies, etc. 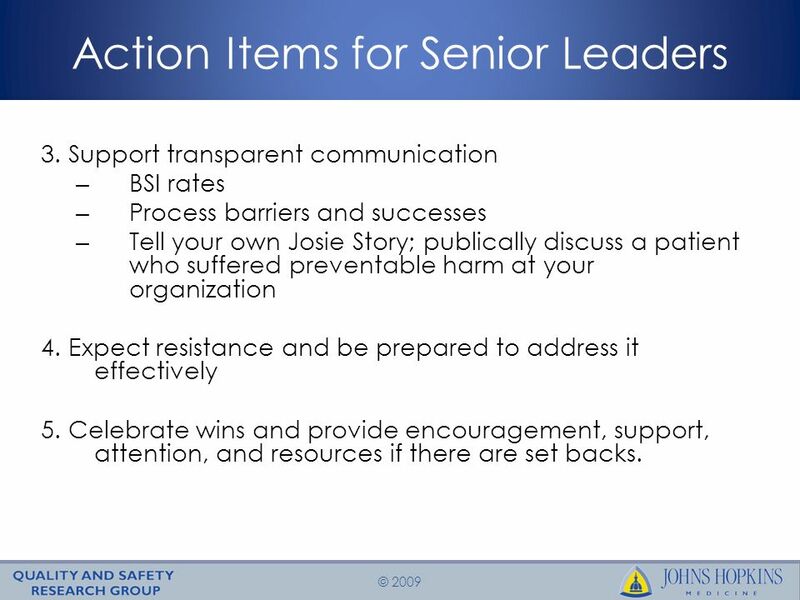 5 © 2009 Action Items for Senior Leaders 3. 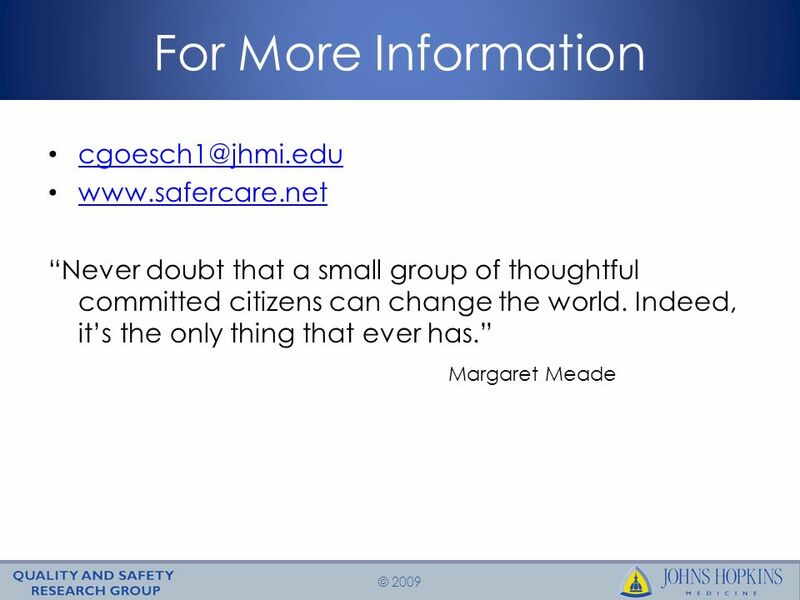 Support transparent communication – BSI rates – Process barriers and successes – Tell your own Josie Story; publically discuss a patient who suffered preventable harm at your organization 4. Expect resistance and be prepared to address it effectively 5. Celebrate wins and provide encouragement, support, attention, and resources if there are set backs. 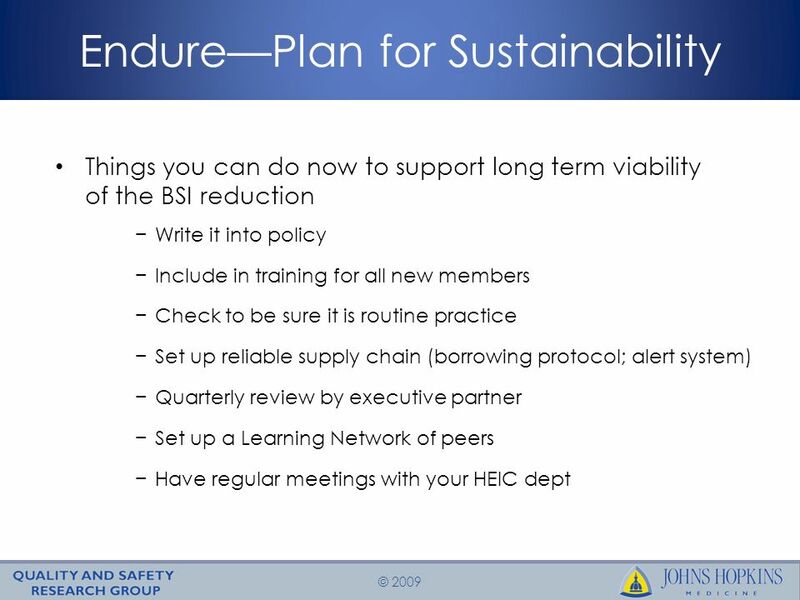 14 © 2009 Reference List Buchanan D, Fitzgerald L, Ketley D, Gollop R, Jones JL, Saint Lamont S, Neath A and Whitby E. No going back: A review of the literature on sustaining organizational change. International Journal of Management Reviews 2005; 7(3):189-205. 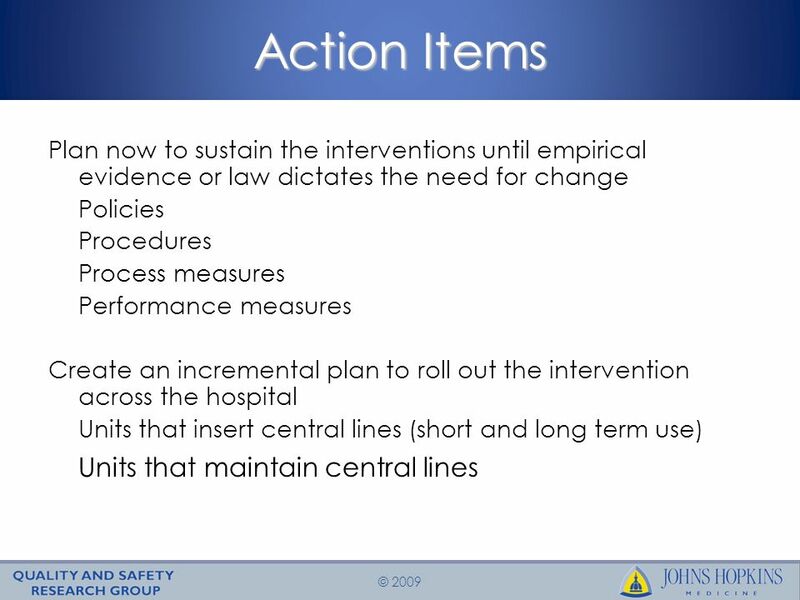 Evashwick C, Ory M. Organizational characteristics of successful innovative health care programs sustained over time. Fam Community Health. 2003 Jul- Sep;26(3):177-93. 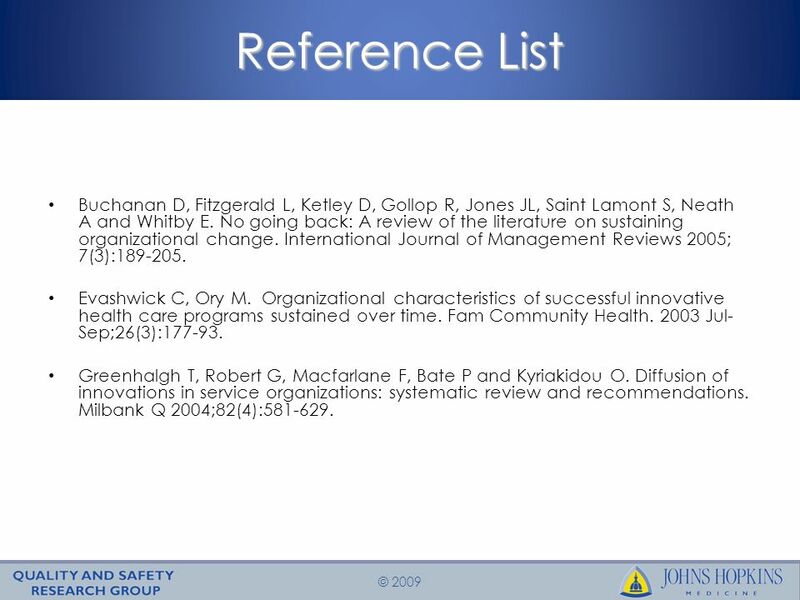 Greenhalgh T, Robert G, Macfarlane F, Bate P and Kyriakidou O. Diffusion of innovations in service organizations: systematic review and recommendations. Milbank Q 2004;82(4):581-629. 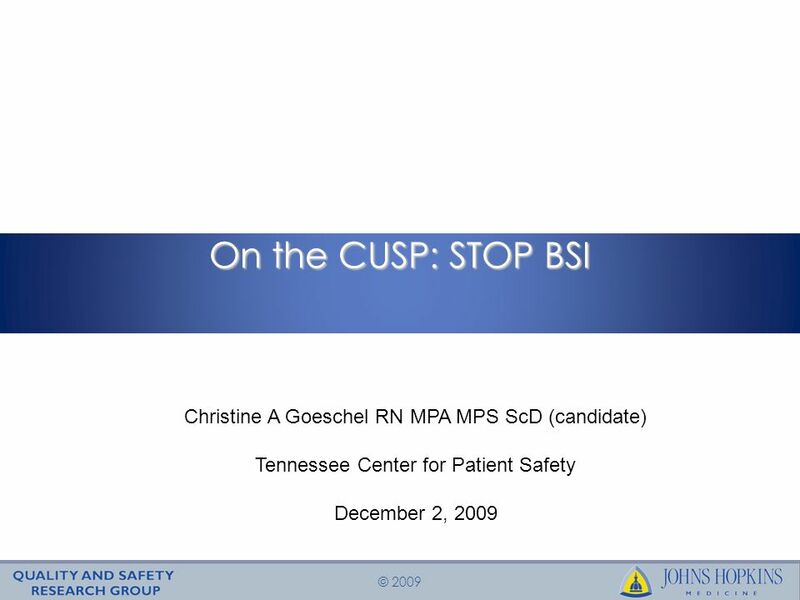 Download ppt "© 2009 On the CUSP: STOP BSI Christine A Goeschel RN MPA MPS ScD (candidate) Tennessee Center for Patient Safety December 2, 2009." 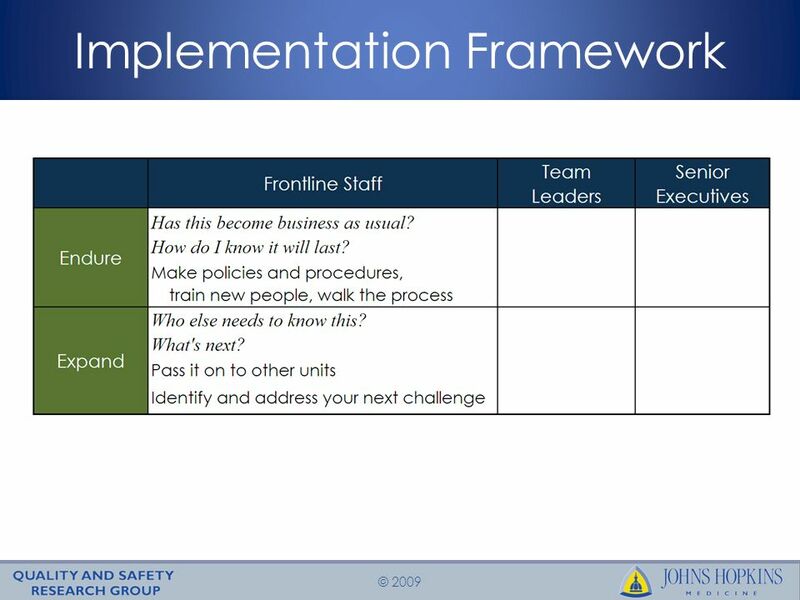 Aim: Advance the adoption of proven strategies to improve the reliability, safety and quality of care received by patients in Tennessee hospitals. Ministry of Labor and Social Policy SOCIAL POLICY COUNCILS Dragica Vlaović-VasiljevićSophia, 2-6th July 2007 Dragica Vlaović-VasiljevićSophia, 2-6th July. Claudia de Windt Senior Legal Specialist Department of Sustainable Development Strengthening Humanitarian Assistance and Prevention and Response Coordination. GUIDED FORUM ON INTERSECTORAL ACTION Communities’ experiences in developing intersectoral actions How to go further? Results of the guided forum January. Children’s Social Care Workload Management System (WMS) A Two-fold approach DSLT 16 th November 2010 Updated with new SWRB standards. 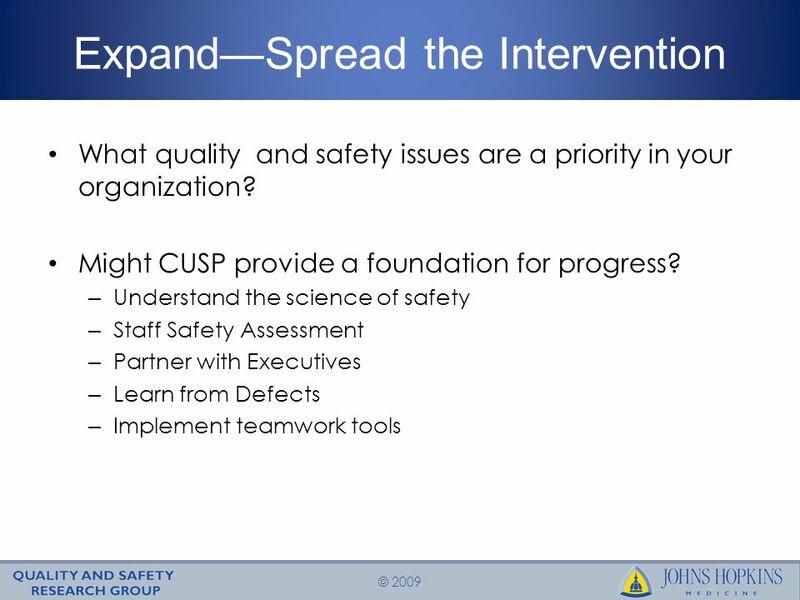 On the CUSP: STOP BSI Physician Engagement. 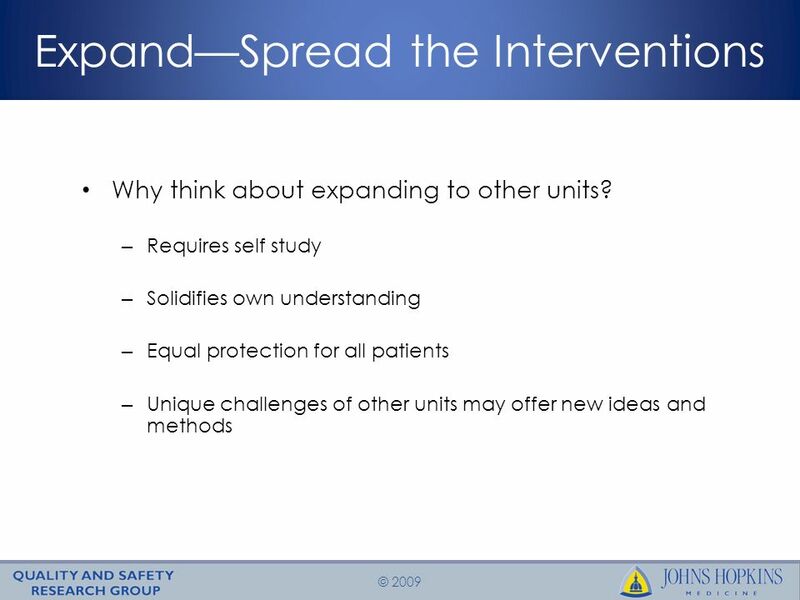 Immersion Call Overview 1.Project overview 2.Science of Improving Patient Safety 3.Eliminating CLABSI 4.The. Presented by: BoardSource Building Effective Nonprofit Boards.